Serendipity Reviews: The Day I Met Mary Hooper. The Day I Met Mary Hooper. 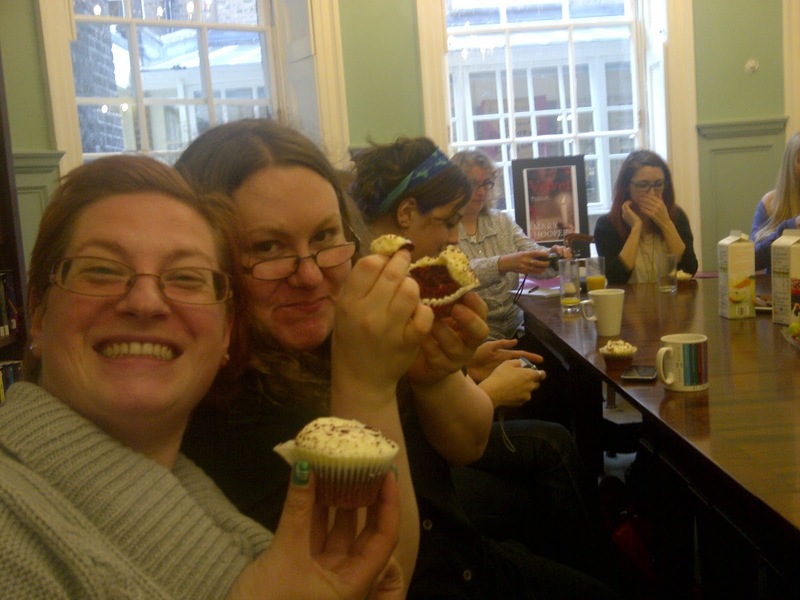 blogging peeps to spend an afternoon talking with Mary Hooper, the author of Velvet and Fallen Grace, as well as many other fantastic YA historical novels. We all went into the new offices at Bloomsbury, which was absolutely beautiful. The building had obviously been a house many years ago and had huge rooms with extremely high ceilings. Mary talked about how she got started in writing YA fiction. She began her career back in the seventies after having her children, she stayed at home and wrote short stories and serials for magazines such as Jackie and Blue Jeans. Her most famous serial was The Pink Ladies which ran for a while in Blue Jeans. Mary told her that she used to get her ideas for her stories by reading the problem pages in the magazine. Mary moved into writing books when she began to write for the Heartlines series,which was the UK's equivalent of the Sweet Valley High books. She also wrote books for other series such as Animal Ark and Puppy Patrol. When Mary came to write historical fiction, she never thought she would be able to as she was convinced that she would need a degree in history in order to be accepted, but after being contacted by Barry Cunningham (Chicken House) she decided to give it a go. She followed in the footsteps of her good friend, Celia Rees, who had just published Witch Child. As she researched her books, she found lots of interesting nuggets of information,especially from sites such as the Old Bailey online. Mary told us that she would never write anything other than historical fiction again as she had found the genre she loved. 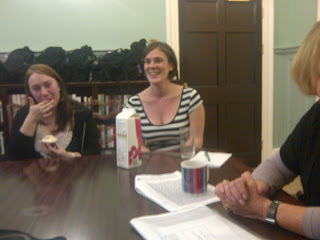 The lovely lady in the stripy top is Emma from Bloomsbury who organised the event for us. She kept us busy with lots of delicious cakes, goody bags and fruit. Guess what we ate first? 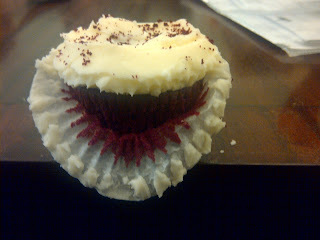 Well the cakes were red velvet ones from The Hummingbird Bakery! As we ate, we asked Mary lots of questions. I was curious to find out how many books she had written altogether and I was quite flabbergasted to discover she had written 100 books. At some points in time she could write a couple a month! 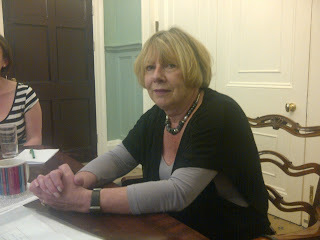 We also asked for some writing advice and Mary told us to always be prepared to go where the market goes. Adapt with the trends you witness. 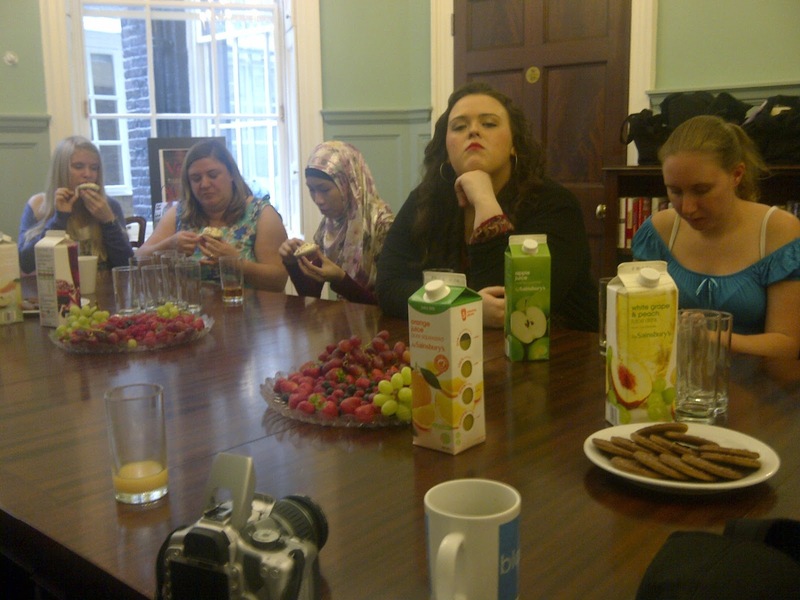 As you can see everyone enjoyed the afternoon with Mary as well as the cakes. Sarah from Feeling Fictional and Sammi from I Want To Read That smiling with glee! Just behind Sammi, you can can see Laura from Spooky Sister, Karen from Eurocrime. and Hannah from My Book Journey. On the opposite side of the table, is Casey and Hayley from Darkreaders. It was the first time I had met these lovely ladies and they were great company. Here is the Raimy, from Readaraptor, attempting to hide from the camera. Hehehehe! 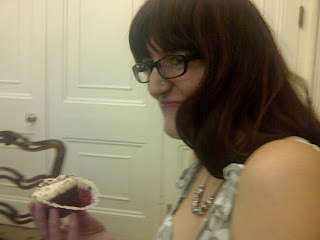 The gorgeous cakes that we all scoffed. 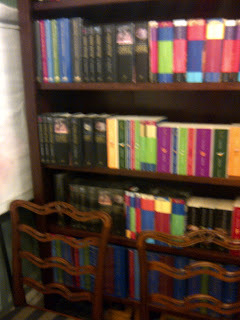 The Harry Potter books! All the Bloomsbury editions on one set of shelves. This was like heaven to us bloggers, all wanting to stroke the books! We all had an amazing afternoon at Bloomsbury and Mary was kind enough to sign all books which we received in a Bloomsbury goody back with a few forthcoming titles. I want to thank Mary for being so lovely to interview and Emma for inviting us in the first place. Wonderful report! I remember Mary Hooper's Heartlines books so clearly (probably because I still have a shelf full of them!) and as for The Pink Ladies - sigh! Great report! I had no idea Mary Hooper had written so many books! Also, those cakes look delicious! You get invited to the best events! I didn't realize you eat red velvet cake in the UK - I thought that was a Southern thing. Luisa - I don't remember any of those books! But then I completely missed the YA and went straight to adult books. Leanna - Thank you! I gasped when she told us she had written 100 books. I came away quite inspired by her. Bermudaonion - that was the first red velvet cake I have ever had! Sarah - sorry the picture was bad,I had to take them all on my phone as my camera packed up. I think it must be so interesting to spend time researching about London's history and past. Mary is obviously really passionate about what people's lives were like, and this definitely comes through in her books! Sorry I didn't get to speak to you too! awesome report hun! It was fascinating to hear everything Mary said about her career, she was really inspirational! it was a fab event and those cupcakes are the stuff of dreams!! wow, that sounds like a great time. And very cool about the harry potter collection.